Manchester United interim boss Ole Gunnar Solskjaer has confirmed that the trio of Alexis Sanchez, Romelu Lukaku and Anthony Martial should return for the Premier League clash against Bournemouth this weekend. 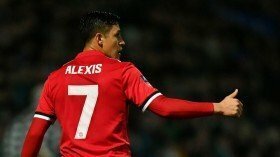 Sanchez has missed the past month with a hamstring injury while Lukaku has been out of action for the previous two league games after taking a compassionate leave. Martial, meanwhile, was left out of the Huddersfield Town game with a minor illness but Solskjaer believes all three should return to contention for the weekend game against the Cherries. "Hopefully the front three with Romelu, Alexis and Anthony - that is not a bad three to have ready," he is quoted as saying by Sky Sports shortly after the club's 3-1 triumph. United have picked up back-to-back triumphs over Cardiff City and Huddersfield Town since Ole took charge of the club and they have the opportunity to extend the run against Eddie Howe's side this weekend. The Mancunian giants are currently eight points behind Chelsea in the pursuit of the final Champions League position but their prospects could be enhanced with the easier-looking schedule for the month of January.